Luminescent yellow-green; this wine glimmers as if internally lit. Quite reductive. Then pungent, verdurous and fusel: lamp oil, celeriac, aloe vera, wolfbane. 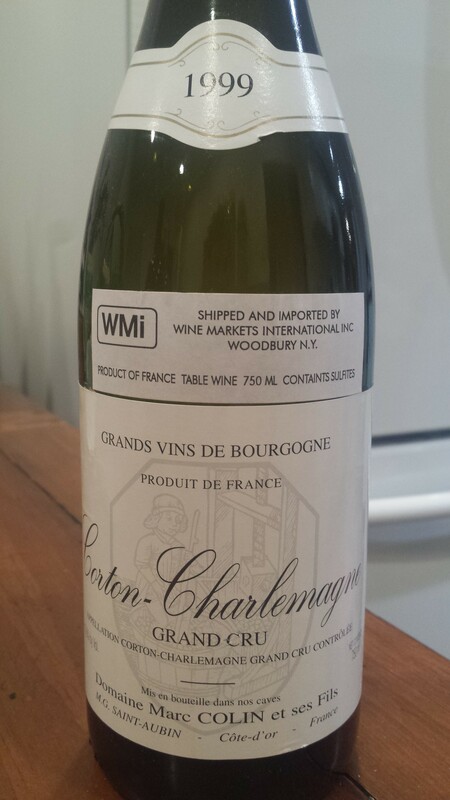 Similarly amylic on the palate, with intimations of plantain-like starchiness: lemon oil, crab apple, wheat kernel. A viscous concentration and still sauvage picquancy. A smoldering blaze of herb-streaked, seemingly cyanic acidity. This grips like a Vulcan: fiercely structured, more reminiscent of a ’96 than a ’99. Carbonized, mineral finish, still somewhat youthfully imploded. How can this be at fourteen years on? If opening this today, consider giving this significant time in the decanter (don’t worry, we don’t think you can oxidize this Marc Colin, even if you left it out for days). Not the most elegant expression but brimming with character. Stentorian, avuncular Corton Charlemagne. Now – 2020+.